As you may know, we have a unique feature on the eClincher platform called the Unified Social Inbox. The Inbox saves huge amounts of time by displaying all your audience social engagements (comments, tweets, pins, likes, shares, etc.) from all of your various social media channels in one place. And this week we gave it a huge face lift with super powerful features for teams. We added a new feature that allows you to assign items from the social inbox to a specific member. Here is a quick refresher if you don’t remember how to create a team. 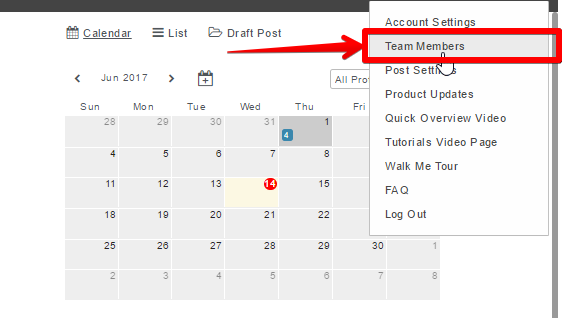 To add team members to your eClincher account click on the menu on the right, and choose Team Members. Here you will see a drop down menu. 1. Write the name, email, and password for your new team member. 2. Choose which social media accounts they can view and/or edit. Now that you have created your team member click on the inbox tab on top. The broad use of the team member feature will allow your co-workers or clients to log in and use your eClincher account. If you have an agency plan then you can assign your team mates to view or edit the brands that you are working with. If you are on the premier plan you will be assigning your teammates to view or edit specific social media accounts. The most powerful feature of team members, however, is used to significantly boost your engagement through our unified social inbox. When you go on your inbox you will see a list of the most recent engagements in the form of likes, comments, tweets, DM’s, etc. You can now assign each engagement to a team member on your team. Once you have created your team members, you will see them when you click on the assign it button. Then simply select the team member, and click ok.
For example, I assigned the recent message from customer “Tracy A Bush” to my newly created team member Tal. Once you have assigned the item to the team member you will be able to see it in the drop down menu again. 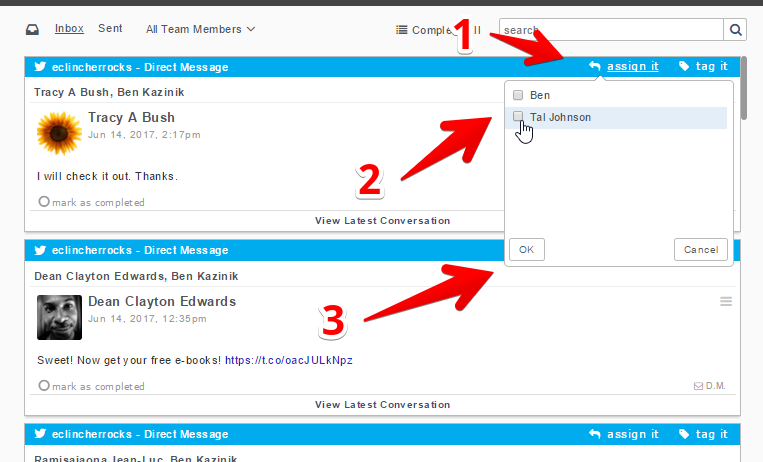 Click on the All Team Members button and when you choose “Tal Johnson” you will see Tracy’s message that I assigned to him. As a side note, every member can see all of the team members’ assignments, as well as all the items in the inbox. Now you will be able to assign specific items to your team. The best part is that you will be able to see which items were completed by each team member, so this will not only increase the efficiency of your team but also your management and accountability. In the future we plan on releasing a team performance report that will measure the performance of each team member in the form of number of cases handles and average case time closure. Hope you enjoyed this tutorial, if you have any questions/comments/concerns/emotional outbursts you can leave a comment below. If some one needs to be updated with latest technologies therefore he must be pay a quick visit this website and be up to date every day. Hi, its fastidious paragraph concerning media print, we all be aware of media is a fantastic source of facts. Aw, this was a really nice post. Spending some time and actual effort to produce a superb article… but what can I say… I hesitate a lot and never seem to get nearly anything done. Hi there excellent website! Does running a blog similar to this require a great deal of work? I’ve virtually no understanding of computer programming however I had been hoping to start my own blog soon. Anyway, if you have any ideas or techniques for new blog owners please share. I know this is off topic but I simply wanted to ask. Thanks a lot! Hello there, I do believe your site might be having internet browser compatibility problems. When I take a look at your site in Safari, it looks fine but when opening in Internet Explorer, it’s got some overlapping issues. I merely wanted to provide you with a quick heads up! Aside from that, great site! Just want to say your article is as amazing. The clarity in your post is just excellent and i can assume you’re an expert on this subject. Fine with your permission allow me to grab your RSS feed to keep up to date with forthcoming post. Thanks a million and please keep up the enjoyable work. I quite like looking through a post that can make people think. Also, thanks for allowing for me to comment! Hello there, simply was alert to your blog via Google, and located that it’s truly informative. I’m gonna watch out for brussels. I will be grateful when you proceed this in future. Numerous other people will probably be benefited from your writing. Cheers! It’s a pity you don’t have a donate button! I’d without a doubt donate to this fantastic blog! I guess for now i’ll settle for book-marking and adding your RSS feed to my Google account. I look forward to fresh updates and will talk about this site with my Facebook group. Chat soon!